Our online store will soon have lots of products to choose from. Stay tuned. One of our latest products that will soon be for sale on our website. It’s been a while since our last blog entry, so let’s get down to the nitty gritty. After a few years of spinning our wheels with different products, ideas, goals, one major house fire, four moves, a rebuild of our home, and all the other trials and tribulations of modern life, we are inching closer to launching our new line of products! You’re probably thinking, “About time.” Well, so are we. 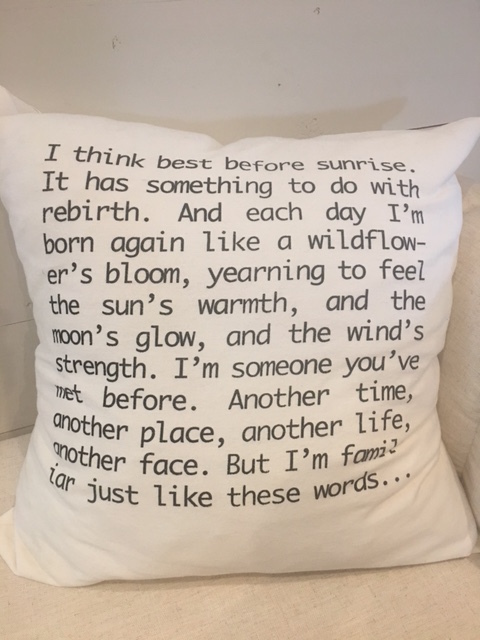 Along with some very cool poetry pillows designed by Jennie with words from my latest book, “I am the Tumbleweed,” we will have a handful of other home goods to offer on our website. We have white denim, blue denim and chambray goods being sewn and finalized. So don’t buy all your Christmas gifts yet. Jennie is in McKinney at the Farm and Ranch Freedom Conference, speaking about our business. I’m here fixing a leaky roof and plowing weeds before the hurricane rains hit. Don’t forget to follow us on instagram and what-not. As I've changed my mind a million times and my gears a hundred more, I always keep my eyes on the horizon. What's coming in the future? What changes must I endure? How many different ways can I steer our family farm into a healthier, more sustainable future and keep it making a profit? I'm constantly faced with the struggle of keeping this farm going for my two sons. Will either one of them even want to farm? Am I the last of my kind? Perhaps I'll be the old grandfather the grandchildren will go to visit on the farm and listen to age-old stories of how "things use to be in the good ol' days." It's comical to think that far down the road. But at times, very necessary. Farmers are faced with more and more greater hurdles, whether economical or via the ever-changing weather patterns. Nothing is a sure thing. Maybe that's why I love farming so damn much. Even when you think you've earned it, it is gone. And as it passes you by, it simply nods and smiles, expecting nothing in return. I've watched many farmers in West Texas leave the business, whether they wanted to or not. Sometimes, we get to leave on our own damn terms. Sometimes, the terms don't give a damn. I fear many more will leave on bad terms over these next few years. I see it coming. And nobody will even blink as millions of lives are changed forever. But I won't be one of them. I'll be around for a long time. And even if neither one of my sons want to farm, at least I will look back some sweet day, and feel like I did my best with what I had while I could. Certain decisions I've made have been dictated by others, but each year I gear myself so that pattern will not prevail. Some day, I'll be 100% organic and 100% at ease with all of this. What happens to the land after I'm gone, I have no control over whatsoever. But at least my words and visions will have been firmly printed on these millions of grains of sand. They are permanent. I am not. And perhaps some day long from now, they will whisper themselves in the ears of unsuspected souls. And they'll stop and stare at the horizon as the feel of change overtakes them and they'll wonder out loud, "Why me?" And I'll simply pass by...and nod and smile, expecting nothing in return. Lots of winter moisture but very little winter temperatures have been the dictating force of our late fall and early winter seasons here on the farm. Over six inches of rain in the past couple of months, while only a few nights of freezing temperatures have delayed the cotton harvest for most farmers in the area. Still trying to harvest the last of our cotton while trying hard to get our first clothing line off the ground. We have wheat and barley growing through the winter, providing some tranquil green patches of earth to behold. We are looking at a spring launch of our clothing line and home goods. Lots of exciting things happening for us, as we continue to transform the family farm into a unique and innovative experience. Well, the proverbial hay is in the barn...so to speak. Got our brown-colored cotton harvested, and it is at the gin waiting to be cleaned and baled. That's the good news. Bad news is it was not easy to get it to harvest. A very dry 40 days of no significant rain from early July to late August limited the fruiting of the cotton plant as this particular variety matured earlier than we anticipated. Working with a brand new variety of cotton, we didn't know what we were dealing with. Planting only ten acres, it was almost not a large enough patch to harvest. Excessive late rains made the cotton plants grow rapidly and much larger than we'd like for our cotton strippers to handle. There was much regrowth of leaves on the plants, as well, causing more greenness than is preferred. Long story short, it is at the gin, but we've had multiple obstacles trying to get it ready, harvested, and ginned. Fingers are crossed, hopefully it is ginned soon. Our first attempt at growing colored-cotton is one we will never forget. We were at the Railyard Park in Santa Fe, New Mexico, this past Saturday. As part of the 1st annual Yogathon put on by Yoga Santa Fe, we were around all day informing people about Allred Farms. It was our first promo for our clothing business. Hopefully, the first of many. If patience is a virtue of living then it is certainly a necessity in the infant stages of a new small business. It has taken three years since our original dream of creating our own clothing line from our own cotton to get to where it is today. And where exactly is that? One step closer to production of our first shirts that are grown and made here in the USA. Our sizing patterns were finalized this past week and are now off to North Carolina, where our chambray fabric will be transformed into stylish button-down shirts. We've gone from cotton seeds to seedlings to mature plants with cotton bolls to cotton harvest to driving four bales of our cotton from Texas to North Carolina and back. We've gone from numerous ideas, looking at various manufacturing stages of denim, visiting with other small business owners, artisans, and inquiring fashionable-appreciative friends about what we're doing and why. By taking our own cotton's future into our own hands, we are able to control more of our destiny not only as cotton farmers but as creative spirits seeking an outlet. We want to connect not only with the land but its people. We'd grown tired of wanting to see more American-made clothing, and decided if we didn't do it ourselves, who would? Now, we know exactly where our cotton is going and to whom. While I've always taken great pride in working with cotton from seed to harvest, we are taking even greater pride in working with our cotton from fabric to fashion in our farm-to-body experience. While we still have a ways to go to our first finished products, we are starting to see some light at the end of this very long and winding dark tunnel. We tossed our huevos off the high-dive with this endeavor, and now it appears the rest of our bodies are leaving with them. It's all a beautiful swan dive in the summer sun. And we can't wait to see our splash along the horizon's glimmering line. One stitch at a time, we are inching our way forward through the process of our "farm-to-body experience." Many of our patterns have been completed, as well as the sizing on the shirts, so we are onward and upward with our dream of planting cotton seeds, nurturing them, harvesting the fiber and turning them into clothing and home-goods we sale ourselves. Things are warming here on the farm. A timely rain has helped our wheat crops kick into growin' gear. We are also preparing the land for the cotton year, as well. Half our acres are in wheat, the other half in cotton. No matter what happens, we'll at least be able to feed and clothe ourselves this year. But, we're hoping on bumper crops for both. We received our first roll of finished fabric from North Carolina this past week. Although the fabric has been ready for quite some time, we're just now seeing it in all of its bulk beauty. There are so many stages from seed to a final product, it is truly mind-blowing for us to witness. We feel like parents of another child, for lack of a better analogy. Throughout this project and entire process, we've changed our minds a couple of dozen times. It appears Allred Farms will be a neurotic compilation of our personalities. Our chambray fabric turned out beautiful. We anxiously await our line of indigo denim as well as white denim. We anticipate having many wonderful options in our clothing and home goods lines of production. Our site will soon have promotional items to help spice up your home with colorful and funky treasures. In the meantime, much of our chambray sits in North Carolina, waiting to be turned into incredible clothing for people to wear. Recovering from yet another tough year of cotton farming, our clothing line is taking more time than we anticipated. What can we say? We're rookies at this. Throughout the trials, tribulations, and turbulence of the various stages, we are learning everything will happen when it is supposed to happen. No since in us announcing any further dates at this point. When we have something, we will be sure to let you know. It's taking us a while to get to the next phase of clothing production. To quote the great Yogi Berra, "We might be lost, but we're making good time," on our journey into the fashion world. Pictured above is a teaser of our first chambray shirt. We will be offering men's and women's sizes. We're tickled with the style, cut, and overall look of the shirts. We hope you will be, too. We're hoping to have shirts for sale late fall. So, if you're planning on purchasing a really cool shirt for yourself or someone special for Christmas, keep us in mind. It's an incredible feeling to hold a shirt in our hands, knowing it came from the seeds we planted and the cotton we harvested. Our cotton is in the next phase of becoming home-grown clothing. NCSU and its students in the Textile Department are hard at work weaving the indigo yarn into chambray fabric for our new clothing company. No, we're not going to tell you what we are making...yet. We'd had to spoil a good surprise and besides, this is about the journey or the process or the ingredients thus far, not the finished meal. Our pattern makers have done an amazing job, as well. Once the chambray fabric is woven, it will be shipped off to be cut and sewn. Everything is done right here in America. We grow it in Texas, have it made in North Carolina, and you can wear it wherever you are. Spring hit the earth running this year with significant rainfall. I feel like a dying man in the desert finding a watering hole at long last. My parched lips and calloused throat is mighty appreciative of this long overdue drink. We've survived one helluva drought these past few years in West Texas. And the recent rainfall is giving us great hope that this will be our first good cotton harvest in over five years. First, we have to get the seed in the ground. We began doing that yesterday. As we embark on our clothing company journey, we never lost site of the fact we are farmers first. Without the seed, we have no cotton to make clothes. Without rain, the seed we plant is useless. Growing cotton out here on the edge of the Chihuahuan Desert, the pickin' is a tad bit slim most years. So, we're banking on this being one of those "bumper crop" years the help get us back on track for the previous four bad ones. We've had a fair share of neurotic weather lately. Hail storms have flared up, beating up our garden a couple of times and my organic wheat crop three or four times. Fortunately, the wheat escaped with minimum damage. A tornado touched the ground half a mile from this field, as well last week. It picked up a neighbor's module builder, tossing it about 50 yards over the fence. Should be harvesting that crop the first week in June. It is my first ever certified organic wheat crop, so there is much pride and optimism with this harvest, as well. Our horse, Hatfield, is in "horse school" near Amarillo. A friend of ours is teaching him how to be a horse and a friendlier compadre to ride. School is almost out so the boys are gettin' spring fever. For a change, sandstorms have been a minimum with makes breathing a helluva lot easier these days. Along with getting ready to plant cotton, harvest wheat and get our line of clothing underway, Jennie and I have been busy in the garden. Everything is thriving in the gentle temperatures and ample rainfall. Jennie is working hard with NCSU Textile Department. She's also working hard at getting my books in local independent bookstores, and raising money for a meditation garden in Santa Fe, New Mexico. She's a busy and wonderfully talented woman. We are hoping that we have our clothing up for sale on our website by October. In the meantime, check out our new organic t-shirts. So, as we enjoy another rainy morning here on the desolate plains, we are looking to the horizon for more rainstorms, as well as a fruitful year on many levels. Our Allred Farms t-shirts are now available for sale on our shop page (made by us.) We are offering white and soft black in men's and women's sizes. They are 100% organic cotton and made in the USA. Very excited to finally have something to offer the general public. Please help support our brand new clothing company in style. Be the first to purchase a very cool and unique t-shirt that is environmentally-friendly and made in the USA. More promotional items will be offered along the way. Our original clothing line will not be available until the fall. Look for more items throughout the spring and summer to help us celebrate Allred Farms. While typing these words, it is hard to believe I'm sitting in the house my great-grandparents built almost a century ago. Farming has shifted so may times in a century, but the bottom line remains a family still has to make a living economically in order to still maintain the lifestyle of a farmer. In just the past decade, I've witnessed volatility in the commodity crop market, taking unexpected gains and un-explainable crashes. Meanwhile, our input prices continue to rise year after year including: labor, fuel, parts, services, seed, fertilizer, and anything and everything from tires to nuts and bolts to bearings. Rapid increase in input prices coupled with unreliable market prices and drought inspired me to start Allred Farms (Herm and Holt Clothing Company) with my partner Jennie Holt. As we continue to wet our feet in the shallow and deep ends of the milling and fashion worlds, we stand strong and proud. Both our historic and present blood, sweat and tears will make this company flourish and grow. While we still have several months until we will hold our cotton in the form of a finished cut-and-sewn shirt, we are having fun learning all the ins-and-outs of a new business. We hope that our story and our clothing will inspire you. Our first bale of cotton is progressing nicely at NC State. The spinning process is complete (as pictured above) and the yarn is being dyed as we speak in North Carolina. Half the yarn will be indigo while the other half will remain its natural color, not bleached like most companies. We're trying to keep everything as natural and earth-friendly as possible in your "farm-to-body experience" at Allred Farms. Our clothing will hopefully be available by September 2015. We will have t-shirts (American grown and made) available later this spring. Stay tuned. Our cotton is in the hands of the very qualified staff at N.C. State in Raleigh, North Carolina. After a mad cross-country dash in my trusty old Ford pickup truck with four bales (2,000 lbs.) of our family's cotton, we delivered it to some very enthusiastic spirits who will begin the spinning and weaving process. In the above photo, Jennie is standing with Dr. Jon Rust, Director of the Zeis Textiles Extension Education at N.C. State and his predecessor, Jim Watson. Together, the two men have almost 100 years of textile manufacturing experience. WE are grateful the university chose to take us on as such a small project is difficult to get off the ground within the United States these days. As most people know, the textile industry is dominated by large corporations who manufacture extremely high numbers of jeans, shirts, shoes, etc. We are not one of those companies. We will produce less than 1,000 shirts in our first year. But from those shirts, we are determined to build something magical. While many textile mills shut their doors in the 1990s after NAFTA and GAAT were passed through legislation, a small percentage of the textile industry is hanging on strong. At Allred Farms, we are determined to continue manufacturing within the U.S. and strengthening our commitment to more jobs and commerce within the States. The U.S. currently ranks fourth in global export value behind China, India and Germany. Once, we were a strong leader. While we may never get their soon, more small, independent companies are taking matters into their own hands to ensure we don't continue to sink in the standings. While our clothing will be more expensive, we hope you find it is worth the quality and hard work we put into it from seed to shirt. It is long and arduous process to get a piece of clothing from a tiny seed into something you can actually put on your body. In our "farm to body experience," we're hoping to educate others of the entire process. We are very excited to get to this point, although we have a very long row to hoe still. Stay tuned. Much more to come. The time has arrived. We are on our way to North Carolina to deliver our cotton for the initial stages of manufacturing at North Carolina State University. For the past couple of years, I've tried to market our non-GMO cotton to various companies to no avail...so my partner Jennie Holt and I decided to start our own clothing company. We are taking four bales and are extremely excited about this new venture with NCSU. One of our mottos is "bare feet, open mind, calloused hands" at Allred Farms. That essentially sums up who we are and what we are about. We start with our own non-GMO cotton seed to help grow the healthiest cotton we can before producing a line of clothing you can be proud to put on your body. Everything will be manufactured right here in the USA. We emphasize quality over quantity and fun over finance. We want to educate the world on what happens during the many stages from planting a cotton seed to making an article of clothing...and have as much fun as possible in the process. We are really tossing our huevos off the high-dive on this venture, but it is going to be a wonderful gamble in the long run. We are betting not only on ourselves but the rest of America to help support what we are about at Allred Farms. The process will take us several months to get it off the ground. We will start very small and hope to grow it into something wonderful. Music has become a huge part of my life, and we are kicking off our musical debut while in N.C. Jennie and I will be playing live at The Eddy Pub in Saxapahaw, North Carolina, this Friday, January 30th at 7pm. If you are in the area, come on out for a good time. It's a great town with a great feel of what community and the future in America can be. Allred Farms will be a unique expression of blue-collar consciousness. With rural roots and urban thoughts, we plunge forward into the unknown and embrace the many challenges ahead of us on this unique business venture. While we are just getting started, we hope you will join us for one helluva ride. We are slowly getting our clothing line off the ground in 2015. It will be a long process, but we want you to be a part of the journey. Stay tuned.